Let’s start with the big one. 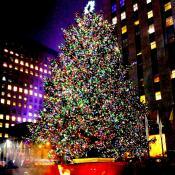 The giant Norway Spruce will be lit up on December 2nd with a grand ceremony between 7p-9p. This is an extravagant event with live music and a global broadcast, so expect more than your usual large crowd. The world-famous tree will stay lit until January 6th. The 19th Annual Holiday lighting will feature a visit from Santa, carols and ice carving demonstrations on December 3rd from 5:30p-6:30p. The event will also include a flotilla of trees on the Harlem Meer. 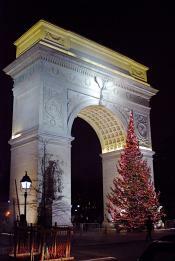 The Battery Park City Parks Conservatory has an evening of Christmas celebration on December 3rd at 5:45pm. The event will have a cappella music, cookies, hot cider and coca at South Cove. On December 6th, there will be an outdoor Menorah lit at sundown. The rows of fir trees along Park Avenue from 54th Street up to 97th will be illuminated on December 6th at 6:30pm. The ceremony was first held in 1945, as a remembrance of those lost in the Second World War. The tradition continues today, helping to serve as a reminder of sacrifice and symbol of peace. The Madison Square Park Conservatory hosts their annual tree lighting ceremony on Tuesday, December 8th from 3:30p-5:30p. The event will feature candy cane craft activities, a fantastic line-up of live music and the holiday favorite Gingerbread Blvd. The tree at the Washington Arch will light up on December 9th at 6pm, while a brass quartet fills the air with holiday spirit. Complimentary songbooks will be provided for children and adults to sing along and Santa Clause himself will come and lead the illumination countdown. A cherished, family tradition: carols, Cantori choir, Orbital Brass, candlelight, candy canes, hot chocolate... and an evening your family will cherish for years to come. Taking place on Sunday, December 6, from 5pm. to 6pm. The lighting will take place on Thursday, December 3rd from 6p-7p in the Pearl Street Triangle and will feature hot chocolate, a visit from Santa Claus, some calypso caroling and some excerpts of “The Nutcracker” by the DUMBO-based Gelsey Kirkland Dance Academy. Donations will also be accepted for the Big Brooklyn Holiday Toy Drive. Sponsored by the Court Street Merchants Association and Friends of Carroll Park, revelers can enjoy refreshments and music and will be able to win a variety of door prizes. The event requests that visitors bring along a non-perishable food item for their annual City Harvest food drive. At the corner of Myrtle Ave and Washington Park on South Oxford Street, the Fort Greene Park Conservatory and Myrtle Avenue Revitalization Project will host their second annual tree lighting on December 6th at 5pm. Caroling, Santa Claus and free holiday cheer await all visitors. An all-day event starting at 1pm on December 5th at Astoria Park will have stories and songs from various cultures and will culminate with a traditional tree lighting ceremony. There will be plenty for the whole family to do on December 6th at the QBC. 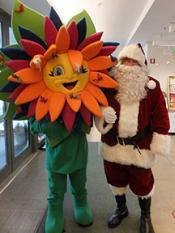 Botanical crafts, photos with Santa Claus, garden tours and live music start at 1pm, with a tree lighting ceremony with Santa at 5pm. 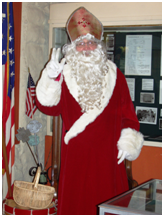 Learn the legend of Saint Nicholas with the Greater Ridgewood Historical Society on Sunday, December 6th. Holiday treats, traditional music and crafts will be available at the historic museum. Adults are asked to pay a $5 donation for entry and children are free. The Glendale Kiwanis club will light the tree at the intersection of Myrtle and Cooper Avenues on Sunday, December 6th at 5pm. This Glendale tradition continues with music, refreshments, toys and a visit from Santa Claus. On December 6th from 11a-7p, the Women’s Auxiliary of Historic Richmond Town will have a winter extravaganza for holiday shoppers looking for unique gifts. Ornaments, crafts and baked goods await holiday guests. A traditional tree lighting ceremony will take place at 5pm. 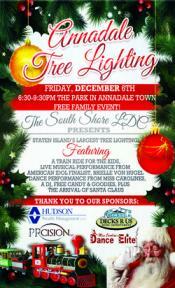 Staten Island’s biggest tree lighting event features giveaways, live musical performances, a visit from Santa and a holiday train ride. The festivities start at 6:30pm and the event is free. Donations will be collected to benefit St. Jude’s Children’s Research Hospital. Holiday fun, refreshments and carols await visitors on Saturday, December 19th at 6pm. Sponsored by the Friends of Westerleigh Park, admission is free to the event.